Seven years ago, structural engineer John Wathne attached a video camera to his son’s toy remote truck and let ‘er rip across the second floor of the Modern Theater on Washington Street in Boston’s Theatre District. He wasn’t certain the floor would hold him. 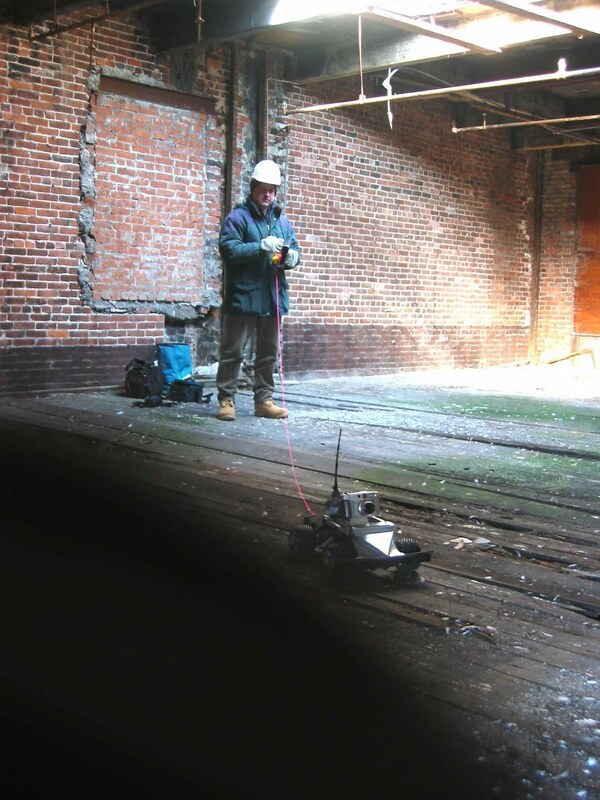 Wathne had been hired by Historic Boston to assess the structural integrity of a long abandoned building that had been open to the elements for decades and was now facing demolition due to public safety concerns. But how did this 1876 building, which contains Boston’s first purpose-built movie theater, get to this point? Let’s back up. In 1876, architectural firm Levi Newcomb and Son designed the five story Ruskinian Gothic structure, known as the Dobson Building. The brownstone warehouse was home to a carpet showroom until 1913 when Boston philanthropist George R. White hired renowned theater architect, Clarence Blackall, to insert a theater into the first floor. Blackall designed a three story, 800 seat auditorium for the viewing of “high class photo plays” and adorned the exterior with a marble faced arched entry. The theater, which later became known as the Mayflower, showed movies into the early 1980s (though mostly in the adult category starting in the 1960s). As Boston’s Theater district fell into decline, so did the Mayflower. The building fell out of use and sat vacant for more than 20 years. In 1995, the City of Boston and the Boston Preservation Alliance held a design charette focusing on the historic Washington Street Theaters. 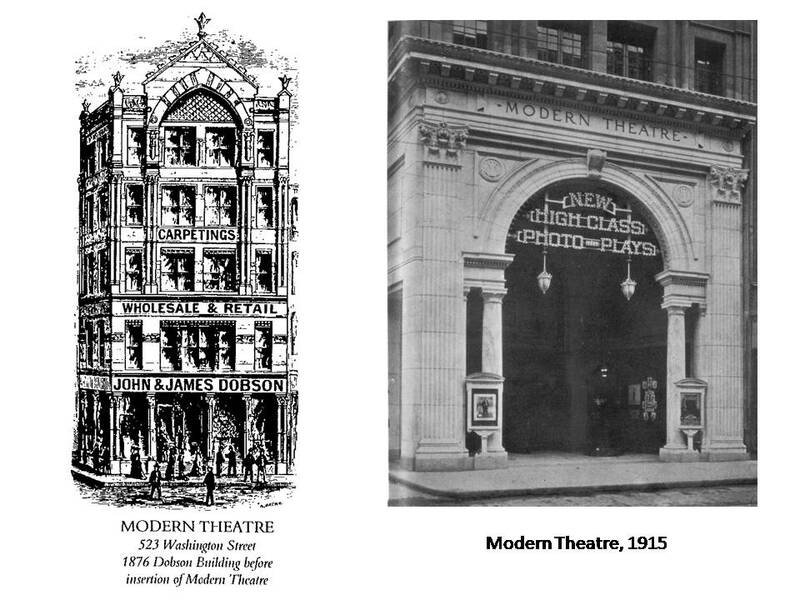 Out of that effort, three theaters were identified as resources that should be preserved: the Paramount, the Opera House, and the Modern Theater. That same year, the National Trust for Historic Preservation named the Theaters as one of the nation’s 11 Most Endangered historic resources. In 1999, Historic Boston placed the Modern Theater in its Preservation Revolving Fund Casebook, calling attention to the decaying interior, but advocating for the preservation of the façade. 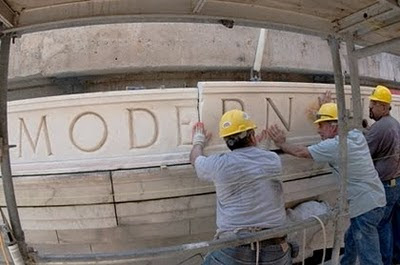 However, the Modern continued to sit, abandoned and in decline. 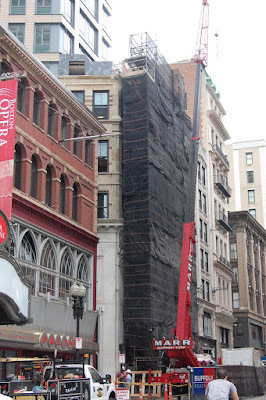 In 2003, the owner of the building, the Henry Levin Trust, asked the Boston Landmarks Commission for permission to remove the pediment of the theater, citing danger to the public. The Landmarks Commission quickly protected the building with Boston Landmark status, but the public safety concerns remained, and the owners soon requested permission to demolish the building. In an attempt to save the Modern from demolition, Historic Boston quickly assembled a team of experts to prepare a report, showing the means, methods, techniques and costs for preserving the building and its façade for later use. Based on this analysis, the Boston Landmarks Commission determined that the Modern could be preserved, and refused to allow demolition. Later that year, the Boston Redevelopment Authority took the Modern by eminent domain and stabilized the building for the safety of the public and for future revitalization. This preservation drama is the precursor (as it often is) to Suffolk University’s more recent acquisition and rehabilitation of the Modern Theater for a dormitory. Due to the deteriorated condition of the building, Suffolk University made the decision to carefully take down the façade, documenting each stone’s exact location, and build a new building in its place, which will contain a small, multi-use theater and more dormitory space on the upper floors (mostly in the new tower being constructed behind the original building). The façade of the historic building is being rebuilt and will soon take back its rightful place in the vibrant street-wall, standing tall with neighbors Paramount Theater (Emerson University) and the Boston Opera House. Between 1995 and 2003, HBI did what it does best: it worked with the City of Boston and private funders to make a case for an important place that, at the time, had no obvious re-use or developer. With all the structural and regulatory protections in place, it was only a matter of time that Suffolk University came forward with an appropriate use and the resources to preserve the historic façade and activate the space for contemporary uses. We are thrilled that the project is getting close to completion and can’t wait to help usher in the new era of the Modern Theater. For more information about the Modern Theater and the 2003 report by Historic Boston that staved off demolition for the building, please read the attached newsletter articles. For more news about the Modern Theater project from Suffolk University, please see this article. To see a photo gallery of the building, including the "before" shots, please visit this site. No doubt modern theaters are awesome, and when a humorist like Bill Bailey Tickets enter into such a theater, he increases its beauty.